Oratorio for soloists, choirs, organ and orchestra. rec. live, 13 January 2017, Hamburg Elbphilharmonie. We’ve previously come across Jörg Widmann both as a clarinettist and composer via the ECM label with his Elegie (review), with Harmonia Mundi for his Viola Concerto (review) and several other releases. Arche came about as a commission for new music to inaugurate the new Elbphilharmonie concert hall in Hamburg, this live recording being a souvenir of that event. Widmann drew inspiration from the shape of the building itself when tackling his score: “From the outside it resembles a ship. To me, the interior looked like the hold of a ship, an ark… Re-emerging into the daylight, the ark idea would not leave me alone. The inflection of the music I had to compose was clear….” In short, Arche is a wide-ranging work that takes in the flow of western history with a mixed libretto sourced from various writers from the anonymous scribes of the Old Testament to Nietzsche, Schiller and Sloterdijk, Francis of Assisi and Michelangelo, as well as drawing on texts of the Mass and Des Knaben Wunderhorn. Jörg Widmann’s studies as a composer included teaching from Wilfried Hiller and Hans Werner Henze, and subsequently Heiner Goebbels and Wolfgang Rihm, but his voice is one that gathers influences from far and wide. Arche might on first impression at times seem a bit stern and Teutonic, in part due to the German libretto, but as an eclectic mix of dark and light and with some stunning effects soon turns out to be more approachable than you might think. 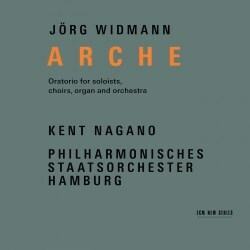 There is a familiarity in its ‘oratorio’ flow of music, spoken text, solo vocalists and choral settings, so this is a world in which you only need really orientate yourself to the diverse facets of Widmann’s idiom, and see if you can extrapolate what you read in the booklet notes to what hear in the work. Unfortunately, the texts used are not printed in the booklet, so we have the movement titles and not a lot else to refer to. Dieter Rexroth’s notes give some points of reference, and sums up the central thread in Arche: “Widmann’s oratorio unquestionably projects a message by touching on the tensions between the world and the individual, and especially on the conflict between God and Man.” The composer himself says, “I find that the relationship between man and God harbours countless questions - questions, not general articles of faith, but existential questions that we direct at God, and that which have remained answered to the present day.” These conflicts are reflected in music that can be both beautiful and extremely violent. The opening has a touch of ‘The Creation’ about it, at the very start with an Ennio Morricone ‘For few Dollars More’ atmosphere, but developing into something that has some glorious musical depictions of light. In the second movement, Sintflut, a gorgeous chorale disintegrates into a kind of chaotic scream, to which the musical reply is a stunningly moving baritone aria stroked by a sotto-voce return to the chorale heard before. There are moments of humour and lightness, a jazz-like passage in the first movement preceded by some audience chuckles that means we’re missing out on some kind of visual gag. Humour is also part of the opening to the third movement, Die Liebe, in which soprano Marlis Petersen does quite an ‘act’, to which the reply is a kind of salon song turn with piano from baritone Thomas E. Bauer. The sometimes sugar-sweet Schumann-esque romance between these two, contrasting with their emotional struggles and hardships and moments of madness, becomes an excellent psychological portrait even if, without the text, we’re not always entirely sure what’s going on. This is followed by a darkly brooding Dies irae in which the spirit of Stravinsky is evoked early on, as well as those of Verdi, Carl Orff and others - Widmann’s “denial of the vindictive God.” Throughout this score we are always carried along by an intense amount of detail and colour in the orchestration, and Kent Nagano is just the man to bring out every nuance. The final Dona nobis pacem starts with a ‘yell’ from the children about computer stuff and the media, developing into “something utopian that we have not yet managed to create.” There are some stunning passages in this last movement, the abyss of existential paralysis for instance being relieved by the innocent rise of a canon started by the children’s voices and turning into a Purcellian hymn of triumph.